You’ve undoubtedly heard of camping in the woods with a tent, campfire and roasted hot dogs. It’s time to take the weekend off to enjoy a camp called “Love”. Feeling like you and your partner never have time away from everyday distractions? Don’t stress – Cupid’s got you covered. This weekend, take a load off and get a babysitter for the kids. Cupid has some date ideas to make both staying in and enjoying nature seem like the best ideas you’ve ever had. Slumber party! Light some candles, dim the lights, and pop in your favorite movie from back in the day. Snuggle up on the couch with your beau and piles of blankets. Relive The Breakfast Club from start to finish and chuckle at the memories it leaves you with. If you live in the NYC area, book a campground outside the city for some time away from the over-bearing lights and intrusive car horns. Black Bear Campground is a great option! 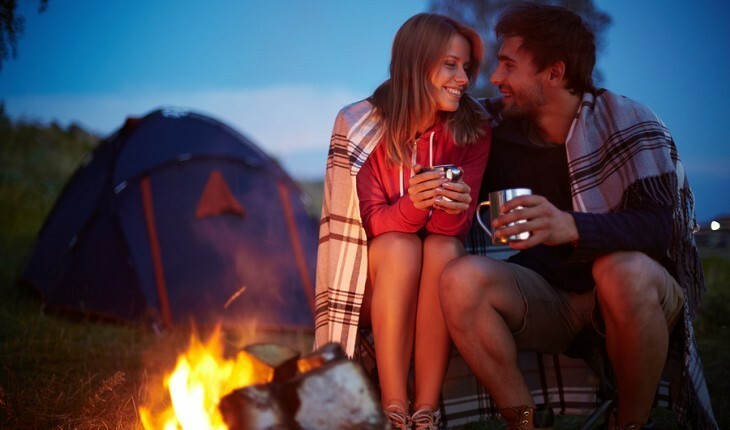 Take a romantic stroll on a nature trail or lounge in front of the campfire as the warm glow illuminates your faces. Look up at the sky. The stars that you almost forgot existed are finally sparkling above you. Not a fan of the woods? Book a room in a nice hotel for the weekend. Get a couples’ massage and take a steamy dip in the hot tub together! Check out Time Out New York’s weekend getaway travel suggestions and stay in the Hampton’s for a change of pace. Have some Couples Camp ideas of your own? Comment below and share with other readers.